Welcome to Ecotherm Energy Systems, Supplier and Exporter of Oil and Gas Burners, Accessories and Spares for Boilers, Heaters and Furnaces. The company was established in the year 1998. We are an authorized distributor of Cuenod and Elco-Klockner and our products are of impeccable quality. Cost effectiveness, Well-timed delivery and efficient transit of products help us to attain an enviable position in the industry. We offer a wide variety of Elco Klockner Burners, Satronics and Honeywell. 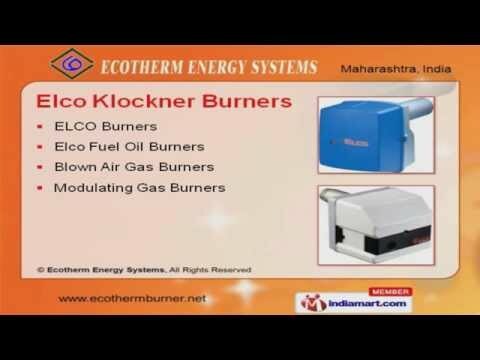 Elco Klockner Burners offered by us are appreciated amongst our clients for superior quality. Fluidics, Landis and Staefa are widely acclaimed in the market. We also provide Satronics and Honeywell that are available at industry leading prices. Our clients can avail from us an exquisite range of Suntec and Petercem. We have been exceptionally able to offer to our customers our range of Dungs and Beru.